THIESD SkTSS IAPAEKMWW 0r EICWUTWLEG AILITURAL WESARCH AININI STRAUTON. onate Or anoxoiba Axo Plun Qupn= SWashington 25, ID. C.
The information contained in this summary.was compiled from material received from the plant quarantine official of Illinois and has been approved by im. It is issued for the convenience of plant quarantine inspectors, shippers, transportation agents, trackers,. and others concerned i the interstate movement of plants, plant products, and other materials subject to State regulation on account of plant pests. The summary for Illinois gives the general requirements for shipping arsery tock into that State, as well as digests of the State plant quarantines and regulations affecting interstate shipments. An appen~ix furni-shes information on post-office requirements for mailing plants, as well as terminal-inspection procedure. This summary does not include digests of nUrsery- stock and plait-quarantine -requirements relating to the movemeat of plants entirely within the State. Inspection Supervisor, Division of Plant Industry, .State Department of Agriculture, Room 300, Professional Arts Building, Glen Ellyn, Illinois. consideration applicable plant quarantines of the.United States Department of Agriculture. In most instances these quarantines regulate the intersate'movement of specified plants, plant products, and other articles from designated regulated areas. However, some of these quarantines regulate the interstate movement of certain articles.into designated protected areas. Copies of such quarantines may be obtained from the Bureau of Ehtomology and Plait Qaarantine, Washington 25, D. C.
Definition of Nudrsery' Stock.--Woody plants, whether nuarsery-grown or wild, and buds, cuttings, grafts, and scions thereof for or capable of propagation, not including greenh6use-grown plants. General Shipping Requiremen.ts.--Any person wishing to ship nursery .st~ into Illinois or solicit orders for nursery stock in the. State must first file with the Illinois Division of Plant Industry a signed copy of his State inspection certificate and keep on file with the Division a complete list of his agents in Illinois. Agents must procure and' carry a permit, Every dealer is required to procure a dealer's .certificate (permit) from the Division and is authorized to sell under his certificate (permit) only certified nursery stock. All nursery stock moving into Illinois'must be labeled with the.nanes and addresses of consignor and consignee and a statement of the nature of the contents and bear a valid inspection certificate of the State.of origin. Carriers are required to report any uncertified shipment of nursery stock to the Division of Plant Industry and hold it for instructions. Any.person receiving uncertified nursery stock must notify the Division and hold it for inspection. Every person receiving nursery stock from a foreign country is required to report it to the Division upon arrival and hold such shipment for inspection or release. Peach or nectarine roots, or peach or nectarine trees with roots, or ny kind. of trees grafted on such roots may be shipped from the regulated areas into Illinois only when accompanied by a nursery-inspection certifite of the State of origin. 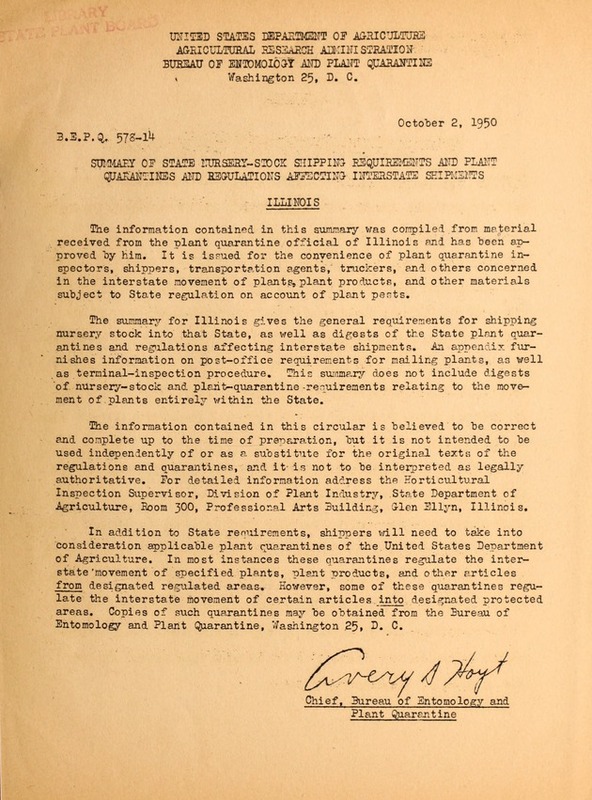 Certificates will be issued only on condition that the nursery and its environs within a mile were inspected and all hony-diseased trees removed prior to June 30 preceding shipment, provided that the presence of the disease in any block of the nursery, or adjacent hereto, shall disqualify for certification all stock in the block or locks other than rootstock from seed planted the previous winter. The foregoing summary was checked and approved on August 30, 1949, SH. F. Seifert, Korticultural Inspection Supervisor.